Possible Cortaro point, El Morro National Monument. Click the image to open the Cortaro gallery. Geographical Range: Southeastern Arizona into southwestern New Mexico, and perhaps as far east as El Paso, Texas, and south into northern Mexico. If correctly identified, one example is known from west-central New Mexico (Catalog No. ELMO 71). Date Range: 4500 – 4000 B.P., but frequently found in Early Agricultural contexts (Loendorf and Rice 2004). Justice (2002) places these points in the Late Archaic to Early Agricultural period. Size: Average – 47.6 mm long, 21.4 mm wide at base, and 6.3 mm thick (Loendorf and Rice 2004:Table 13). Shape: Triangular or leaf-shaped, with excurvate sides; no notches, stem, or serrations. Base: Concave (deep to shallow) to nearly straight; basal thinning accomplished with a single percussion blow or by pressure flaking. Materials: Chert, chalcedony, rhyolite, obsidian, quartz, and basalt. 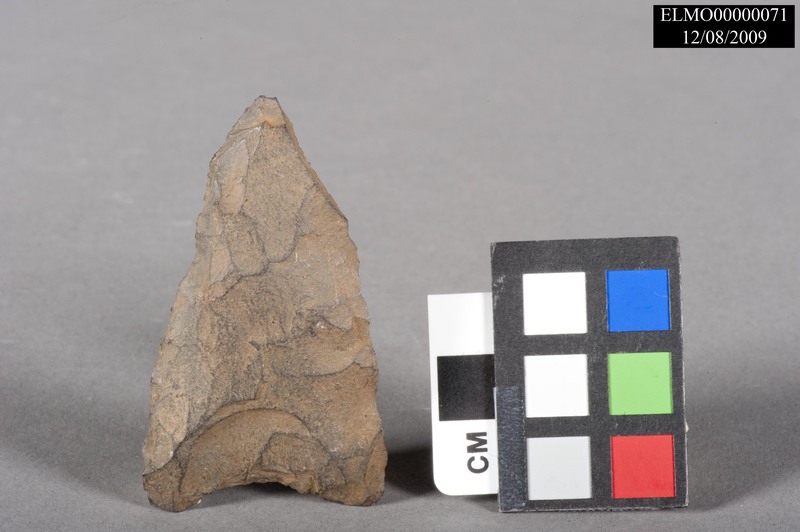 Comparisons: Cottonwood points and other Ceramic Period and Late Prehistoric un-notched triangular points are substantially smaller. This point type can be mistaken for late-stage point/biface preforms. Loendorf, Chris, and Glen E. Rice. (2004) Projectile Point Typology, Gila River Indian Community, Arizona. Anthropology Research Papers No. 2, Gila River Indian Community Cultural Resource Management Program, Sacaton. Sliva, R. Jane. (2009) Common Middle Archaic and Early Agricultural Period Points in Southern Arizona. Archaeology Southwest 23(1):Supplemental Material.